I was rooting for the Packers in the Super Bowl. I’m not particularly a Packers fan (I like the Rams and the Cardinals), but I have some friends who are big Packers fans. Plus I have always disliked the Steelers. One of my reasons for disliking the Steelers is pretty irrational. I don’t like that they only have their logo on one side of the helmet. This unbalance has upset me since childhood. I looked up the reason for it and discovered that it’s due to ambivalence on the part of the team that the logo would be well-received, so they tried it just on one side. After all these years, can’t they commit and put it on the other side? Another reason also stems from childhood. I was a big fan of Roger Staubach when he was a Cowboy. I disliked Terry Bradshaw. The Cowboys and Steelers were rivals, so I had to go with the Cowboys. The final reason is current. Ben Roethlisberger seems like a thug. Mix gelatin with hot water until dissolved (approx. 2 mins). Add cold water, stir. Let sit until steam dissipates. Add alcohol, stir thoroughly (1-2 mins). Pour into jello shot containers. Refrigerate until it begins to set – a skin will form on top. Mix gelatin with hot water until dissolved (approx. 2 mins). Add cold water, stir. Let sit until steam dissipates. Add alcohol, stir thoroughly (1-2 mins). Let cool. Pour into jello shot containers on top of 1st layer. Refrigerate until set. Yields 20 shots. I rushed these shots a bit and there was a little mixing of the yellow and green jello, but they still turned out good. Midori melon liqueur made them very tasty, especially mixed with the Tropical Fusion Jell-O (green in color). I bought that Jell-O last summer but haven’t seen it since. Maybe it was a limited edition. I guess if it was truly a Packers shot, it should have involved cheese. But I just kept the cheese in my fondue pot this time. It turned out to be a good game, and between the 5 of us we polished off all 20 jello shots which even helped make the Black Eyed Peas halftime show entertaining. I made 4 new Jello Shots for Jellopalooza. 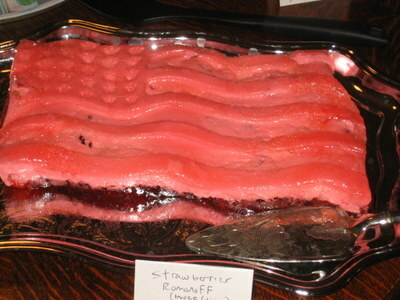 It’s my hope they will make the meat and fish jello go down easier, but I don’t think my guests tend to overindulge in the jello shots enough to achieve that effect. I’ll describe them in the order they were ranked. This one was awesome and scored 4.3 on a scale of 1-5. The Hot Damn! schnapps went well with the orange jello. It even smelled like cinnamon. Ivanna wrote, “Nice and refreshing.” Larisa wrote, “super yummy for the holidays!” I would definitely make it again. This one was also very good, scoring a 4. Black Cherry jello can sometimes be hard to find, so when I see it at the store, I usually buy a few. It also is used to make fabulous Coke Salad! Anyway, amaretto makes for a smooth and tasty shot, combined with the black cherry jello flavor. This one scored 3.1. It tasted a little antiseptic. Dave called it “mentholish.” Ron thought it tasted like “lime jello with a hint of now or later sour apple candy. not good.” Larisa, on the other hand, enjoyed it because it tasted like “a apple jolly rancher.” Perhaps more apple pucker, less vodka would help the flavor. This one only scored 2.6. Not surprisingly, it tasted very boozy, which was a turn off for my guests who prefer the sweeter shots. Ivanna wrote “just tastes like alcohol. period.” Shelby, however, gave it a 5 because it was “yummy and strong.” Larisa thought it would be “good for a big sorority party.” Maybe increasing the cola would help, but then again, I’m not sure something named after Long Island Iced Tea should be watered down. If you like it hard, this one’s for you. Ram it down! The standard mixing directions apply if you want to try these shots. Mix jello with hot water until dissolved. Add cold water and stir. Let sit for a couple minutes, then add booze. 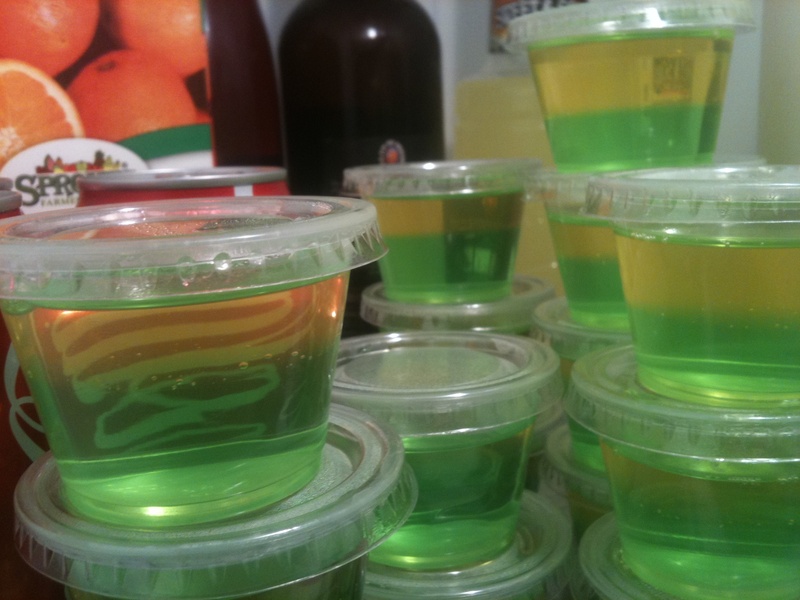 Stir and pour into jello shot containers. 3 oz of jello will yield 8-10 shots. 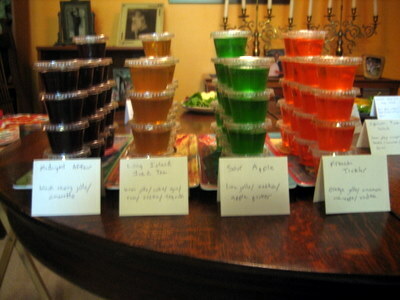 All these recipes and tons more can be found in Your Complete Guide to Jello Shots by Aaron Wright. You can buy jello shot containers at Party City. I had high hopes for this one, but it was disappointing. I love pears, and I love jello and cream cheese combinations. But somehow, this one didn’t quite deliver. I don’t think the ginger really went well with the pears, and the ginger flavor was too dominant even though I only used the requested 1/8 teaspoon. The recipe called for canned pear halves, lime jello, salt, lemon juice, cream cheese, and ginger. There’s a layer with cream cheese in the mix, and a layer without, so the dish has a pretty appearance. For some reason the recipe recommends serving with mayonnaise. Mayonnaise? I didn’t do this. I have to draw the line somewhere. Maybe that is why the dish didn’t do well? Would mayo have actually improved it? Mayo, ginger, and pears? Blech. I’m guessing they added the mayo because this recipe is in the “Salads that Make the Meal” chapter. Every other recipe in that chapter involves veggies, meat or fish (or all of the above). So I’m not really sure why this fruit dish is thrown in there. Maybe the mayonnaise addendum was a last minute thought to help the recipe fit into this chapter. Guests scored this a 2.6 on a scale of 1-5. 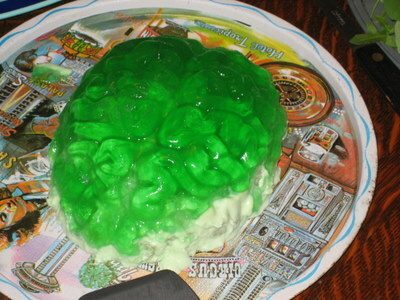 Perhaps it would have been more appealing if I hadn’t made it in the brain mold? I’ve still got a bunch of recipes from my November Jellopalooza 2 event that I haven’t written up, so it’s time to catch up. Strawberries Romanoff was the 2nd most successful dish of the day, scoring 3.9 on a scale of 1 – 5. Clearly the writer of The New Joys of Jell-O was impressed with this dish, since he or she chose to put a photo of it as a chapter heading. It’s probably my favorite photo in the book. A couple are about to walk into a house. Clearly they are guests at a dinner party, although we cannot see the hostess. The gal carries Strawberries Romanoff in a large glass bowl, and she has coordinated her outfit to match the jello. 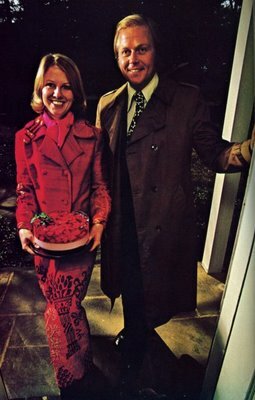 The couple smiles and seems to be saying, “Hello hostess, we’ve brought jello! But not just any jello – Strawberries Romanoff!” And thus begins the chapter entitled “Bring on the Super Desserts.” Super Desserts? Oh, they’ve already been broughten. The recipes involves strawberries, sugar, strawberry jello, brandy, Cointreau, and cool whip. You make a layer with the cool whip and a layer without, so the dish has a pretty layered appearance. You serve it from the bowl without unmolding it, according to the instructions. Because of the high volume of jello dishes I made for the party, I was running out of large bowls, so I made it in my flag mold and did unmold it, so mine didn’t turn out so pretty. I thought the berry and booze combination worked, but some guests felt it was too boozy. I would make Strawberries Romanoff again. And if I brought it to a dinner party, I would be sure to wear red. If you want a more traditional non-jello version of Strawberries Romanoff, here’s Emeril’s recipe. It’s not a cool yule without eggnog. But eggnog and jello? Does it work? Yeah, actually it’s not bad. It’s better than it looks in these iphone pics, I swear. I made Jellied Holiday Nog for a dinner party. The recipe involves lemon jello, jello vanilla pudding, sugar, dream whip, rum extract, vanilla and nutmeg. It turned out to have a pudding consistency. I didn’t try to keep it in a mold but let it run free. It made a nice sidecar to the delicious layer cake made by HungryKat. I think if I made it again I’d put real rum in it, and more than a dash. Even though the recipe involved no actual eggnog, it did taste noggy, due to the rum extract, vanilla, and nutmeg. Jello magic! 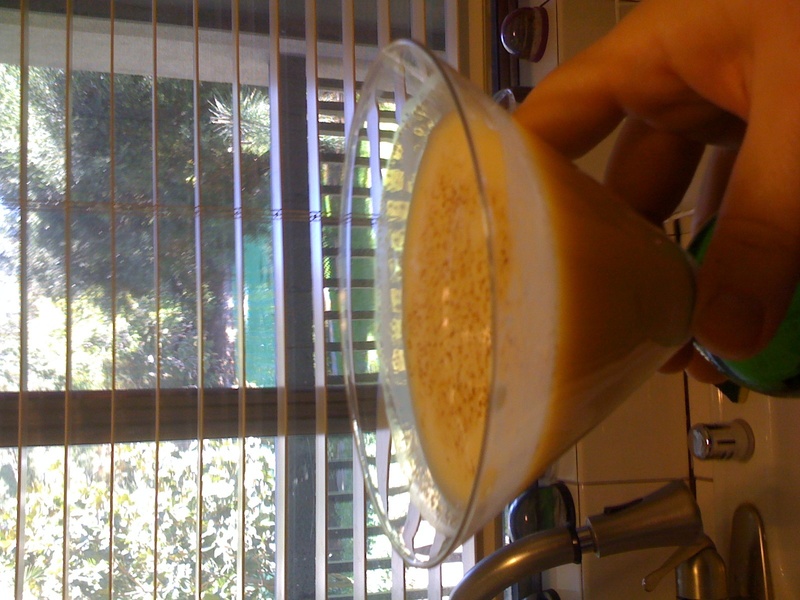 My favorite seasonal eggnog recipe is for an Eggnog Martini. I got this recipe out of Sauce Magazine. If you happen to have any eggnog left in your fridge from the holidays, try this out. Chill the first 4 ingredients in a shaker with ice. Strain into a chilled martini glass. Sprinkle with nutmeg. Enjoy! On New Year’s Eve, I figured if I was going to make jello, it had to involve booze. So I chose to make Grasshopper Dessert. Dave and I were staying in on New Year’s, and he loves mint, so I thought this would be a good choice. He pronounced it the best jello yet! I thought it was good but not awesome, but then I am not a huge mint fan. 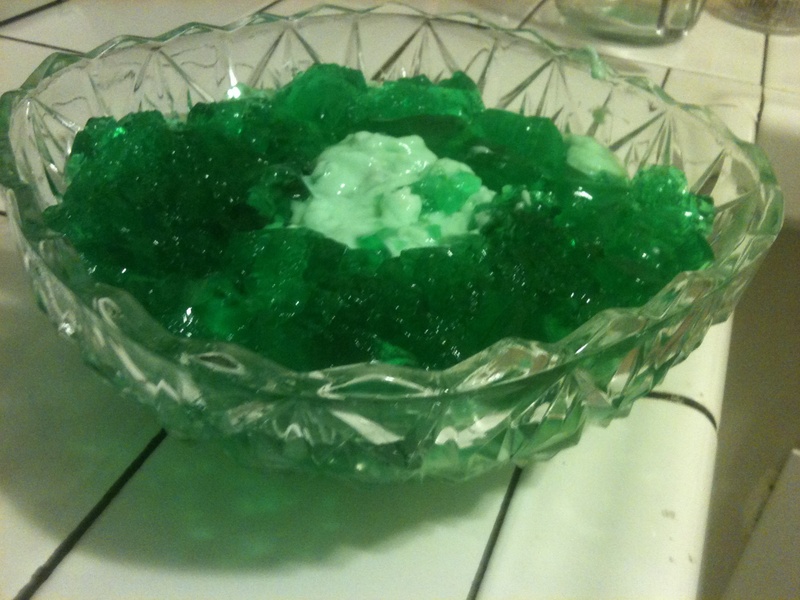 The ingredients were lime jello, sugar, creme de menthe liqueur, and dream whip. I had to go to 3 liquor stores before I found creme de menthe, and the lone bottle they had was very dusty. I guess people aren’t drinking a lot of grasshoppers these days. Growing up, I recall my mom sometimes ordered a grasshopper with ice cream as a dessert drink. Do any bars still make that? Part of the jello was made the usual way, and then cut into cubes. The rest of the jello was blended with the dream whip. As directed, I arranged the cubes of jello in a ring around a creamy center of boozy jello dream whip. It turned out pretty and would be a good choice for St. Patrick’s Day. As it was New Years Eve, I had to reflect on my first year of jellocraft. I made 29 of the 109 recipes in the cookbook. I also made some recipes and jello shots that weren’t in the book. So I didn’t match Julie of “Julie and Julia” who finished her cookbook in a year, but I hope to double my efforts this year and finish it in 2011. I have to blame the savory jellos. The experience of making them and eating them would cause setbacks and lack of jello motivation. But, continue I shall! I wish you all the best in life and jello in 2011! I’ve been dreading making this recipe ever since I saw the picture in the book. While I do dig on swine, I don’t really care for ham. And I don’t much like hard boiled eggs either – in fact, I had to visit ehow to find out how to properly hard boil eggs in order to make this recipe. Pathetic, I know, but I never eat ’em. Anyway, I figured if I was going to have to endure this dish, it would be easier to be surrounded by friends at Jellopalooza II. This is the first recipe I’ve made from the “Salads for the Slim Life” chapter of the book. Making the dish was pretty easy. I chopped up a ham steak, hard boiled and sliced the eggs, and chopped celery and onion. The recipe called for lemon jello, with some vinegar added to cut the sweetness. I was supposed to use a loaf pan, but I don’t have one, so I used a small cake pan. I set a shallow layer of gelatin and then layered the egg slices. I then mixed the other ingredients into the rest of the gelatin mix and put it on top of the egg layer. I followed directions but my egg slices floated up a bit into the rest of the mix and the finished project didn’t have the neat rows of eggs like the cookbook illustration. Maybe I didn’t let the bottom layer set long enough, or maybe it’s because I used the wrong pan. Oh well, I don’t think neat rows of egg slices would have made this dish more attractive or palatable. Surprisingly, it didn’t taste as horrible as I expected. It was edible, especially if you didn’t think about it being a jello dish and focused on the ham and egg flavor. The look of the dish is just so foreboding, however, that it’s pretty impossible to enjoy. My guests graded it a 1.5 on the scale of 1 to 5 (1 being disgusting, 5 being delicious). 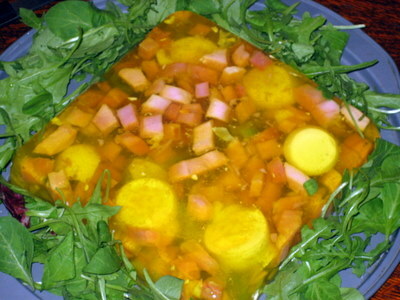 So it came a close second to Jellied Fresh Vegetable Salad (1.4) for worst dish of the party. “Just tastes like ham and egg and jello. Doesn’t go together but not bad/nasty” – Ivanna, who gave it a 3 – very generous! 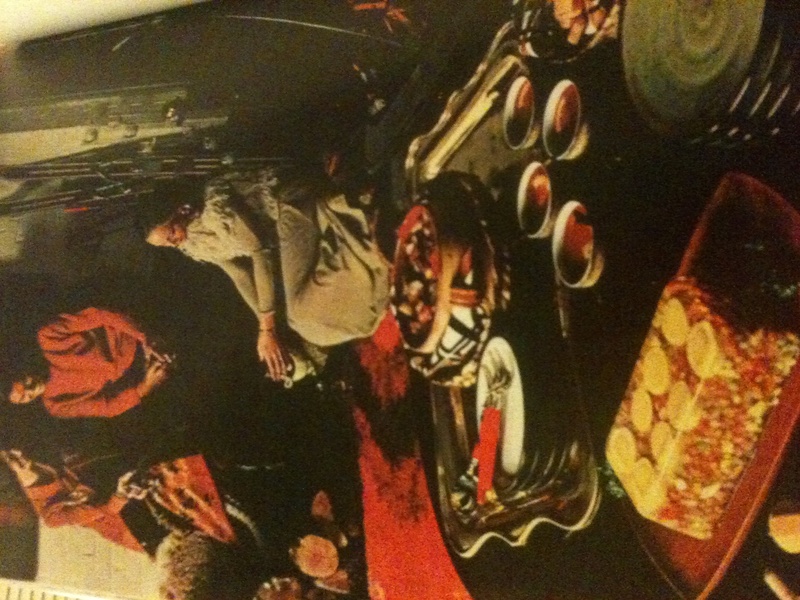 If you are wondering why the party guests in the jello cookbook photo are smiling, I would say it’s because they are sitting far away from the Molded Ham and Egg Salad and they haven’t eaten it yet.